Automatic, that little dongle you can stick in your car to see your MPG, time driven, and other various info from your car’s computer, released an app called AutoDash for Android users this week. 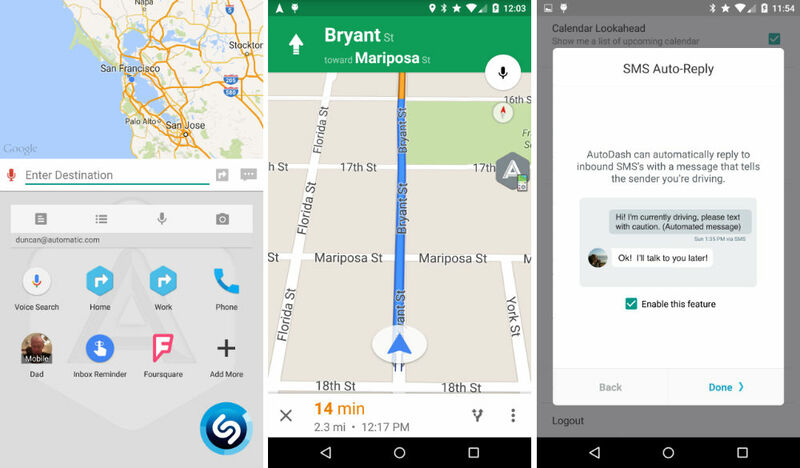 With it, you can set up a screen for when you are driving, offering quick access to apps, Shazam, and Google Maps navigation. When you open up the app, you set shortcuts through various applications. For example, you can set a navigation shortcut to work or home, and also set shortcuts to conversations inside of your messaging applications. To make the app even sweeter, users can even pin widgets, giving quick access to Shazam, Google Keep, or anything else. The app is free to download from Google Play, available right now. And no, you do not need to have an Automatic dongle in order for the app to work. Although, a bit of added functionality is available if you do.